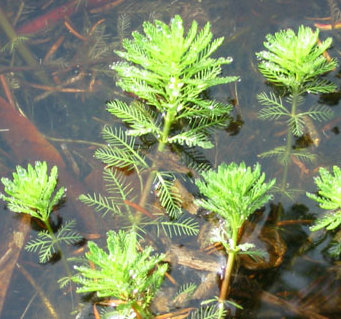 Parrot's Feather (Myriophyllum aquaticum) Water milfoil family (Haloragaceae) is a flowering plant, Parrot feather is native to the Amazon River in South America, introduced to the United States in the Washington, DC area about 1890. Now they are found on every continent. A flowering plant with two cotyledons, the stem grows by deposit on its outside, usually called parrot feather and watermilfoil. Parrot-feather was Commonly sold for aquarium and aquatic pond gardens, it has become exotic in ponds and other calm water bodies in this region. Parrot&apos;s Feather lives in the wild in ponds, lakes and canals, tributaries (A river or stream flowing into a larger river or lake). It likes good sun light, slightly alkaline and high-nutrient water. It can form thick mass and compete with native aquatic plants, usually in shallow ponds. mosquito larvae hides in its dense mats.